In terrazzo cleaning and maintenance, it is often the practice to coat or wax terrazzo to achieve a polished look, but these coatings have a tendency to yellow and collect dirt and must be repeatedly stripped and reapplied. At Natural Stone Care, we find this coating process to be not only time-consuming and costly, but also unnecessary. There is a much better way. 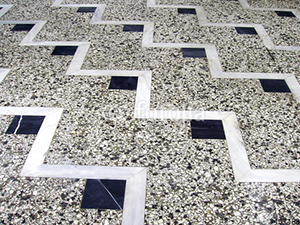 Terrazzo can be honed and polished to a natural satin/matte or glossy finish, eliminating the endless cycle of waxing or coating and stripping. With our terrazzo services, your floor can be as easy to maintain as a quick sweep and a damp mop. For a free estimate on terrazzo floor polishing, terrazzo cleaning and sealing, or other terrazzo repair, restoration, and refinishing services throughout Southern CA or the San Francisco Bay area, contact us online or call (866) 985-0211 today.